The Blonds Spring/Summer 2018 collection was inspired by the intersection of music and life — specifically Elvis Presley, Prince, Grace Jones, and musicians of the late 70s and 80s. Arguably one of my fave shows every season, it’s always a performance of spectacular fashion and personalities both on the runway and backstage. This season, I spend the majority of my time backstage admiring both the hair styled by Kien Hoang using Oribe and the intricate clothes adorned with thousands ofPreciosa Crystals. Kien Hoang used Oribe Hair Care to create a wet, ultra-glossy hair style to complement the looks. The natural texture of each models hair was embraced and enhanced with a cocktail of oils, including the new balm-to-oil Gold Lust Pre-Shampoo Intensive Treatment, launching this month. We wanted the girls to look like they just came out of the pool, Kien explained. The hair will whip and flick as they walk down the runway. 1. Saturate the hair with Run-Through Detangling Primer from roots to ends to add moisture and prep the hair for styling. 2. Emulsify the balm-to-oil Gold Lust Pre-Shampoo Intensive Treatmentby rubbing between palms, then finger-rake through the hair, beginning at the crown moving down towards the ends to create texture. 3. Follow with Curl Gloss Hydration and Holdand Cte dAzur Luminous Hair & Body Oilfor added shine and separation. 4. Diffuse hair at the top to create lift at the crown. 5. Apply Royal Blowout Heat Styling Sprayfor heat protection before tapping a flatiron down strands to create a piecey texture. 6. Use fingers to mold hair back away from the face, leaving pieces out to frame the face. 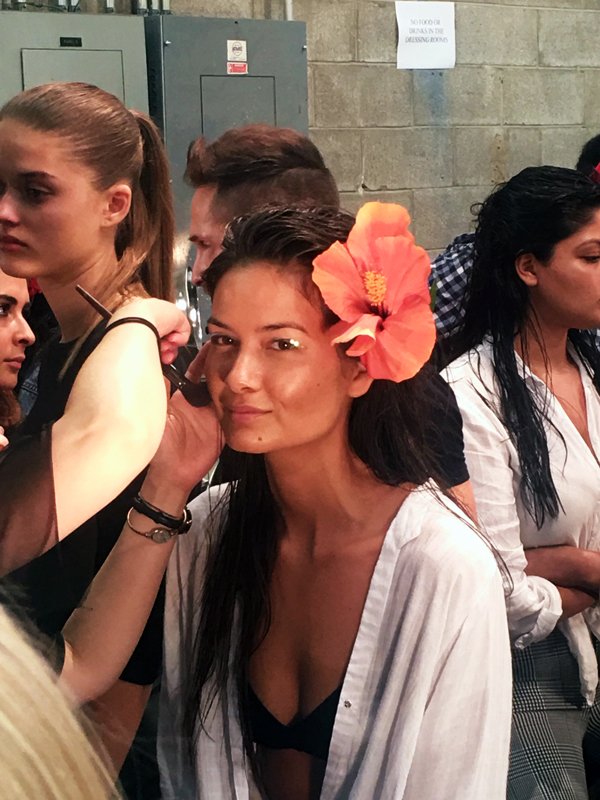 Tuck hair behind the ear on one side, anchoring it in place with red hibiscus flowers. 7. 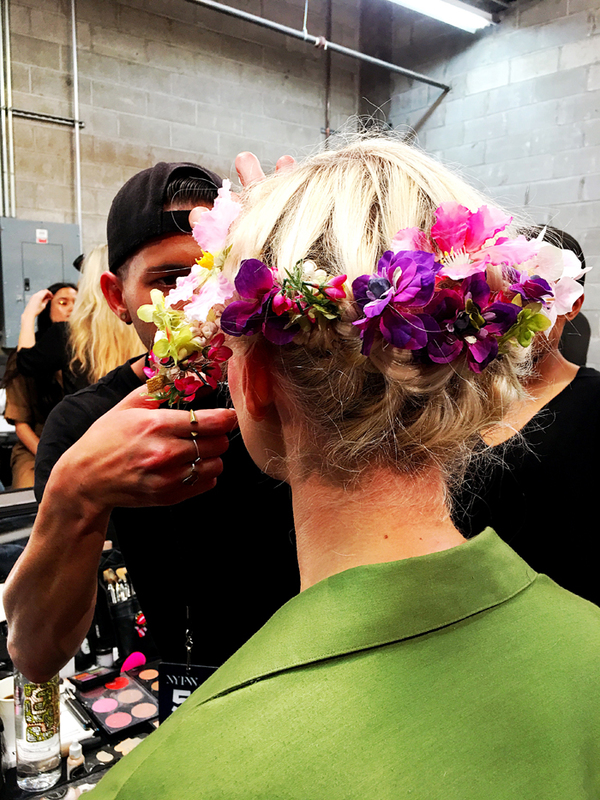 Mist the flowers with Cte dAzur Luminous Hair & Body Oil for a wet and shiny finished look. Now, once you’ve achieved this ultra-glossy style, it’s time to pair it with the perfect look (AKA anything that sparkles as brightly as thePreciosa Crystal covered bomber jacket).This season is a vision of a platinum paradise, full of diamond studded leopards and crystal waterfalls. This collection was brought to life utilizing Preciosa elements such as hot fix and cushion cut stones in all shapes and sizes. This season we have also included a look inspired by crystal itself and all of its many facets, which was put on display at the show, said David Blond. Shining bright down the runway this season was the iconic leather jacket weighing over 50 pounds. That’s one strong model! At least she can now consider herself one among a select few individuals who get to grace their bodies with so much sparkle. 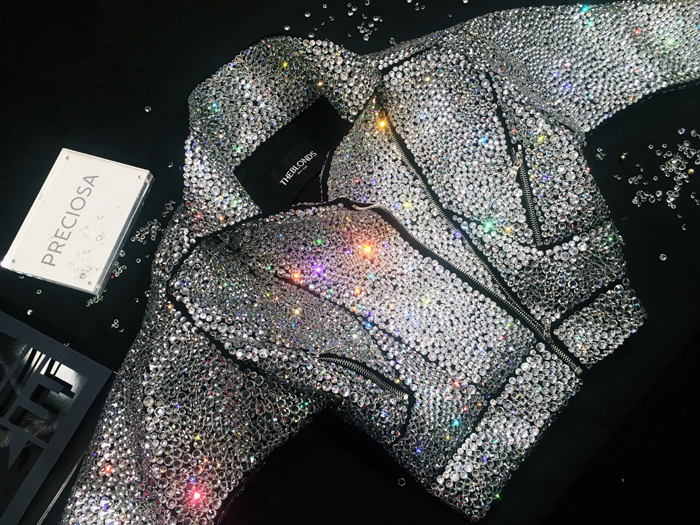 One-of-a-kind pieces by The Blonds incorporating Preciosa crystals are frequently worn by world-famous performing artists, such as Jennifer Lopez, Britney Spears, Beyonc, Gwen Stefani, and Lady Gaga.